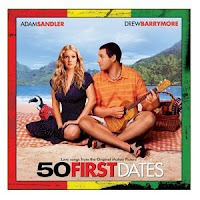 50 First Dates Forgetful Lucy. Lucy is Drew Barrymore's character with Adam Sandler in the movie with the same title. The movie is about Lucy suffering from a rare form of amnesia wherewith she relives a specific date over and over again. It was the day before she and her father met a terrible accident which coincided with his birthday. She goes to therapy of course, and there were others who are confined to the same institution with unique cases as her own. One who was notable is the guy who forgets every 30 seconds that all you ever can do with him is to introduce yourself and vice-versa. I have seen all too many movies and T.V. shows with an over killed story line like it, yet this is the most interesting among all. It maybe far from reality and may even be of one in a million instances to be true, yet the thought that love is not forgotten be it as it may that you forget the person him or herself is something worth remembering in a movie.